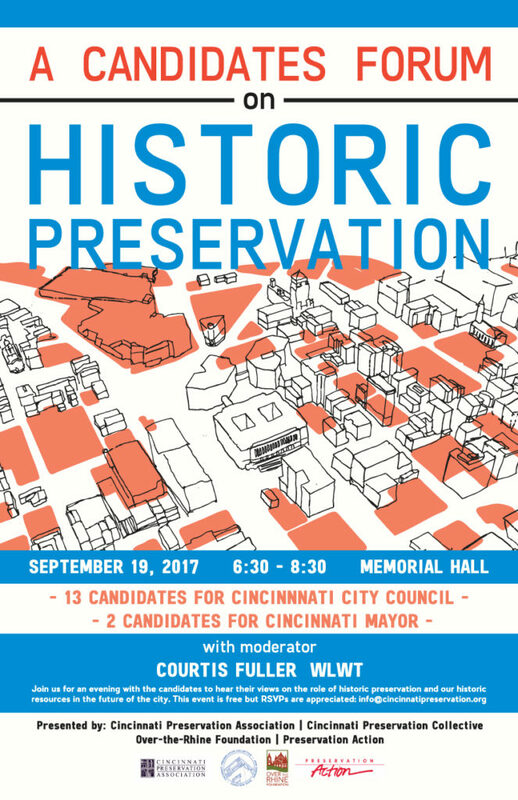 We would like to thank all of the candidates and voters who participated in the Historic Preservation Candidate’s Forum at Memorial Hall on September 19, 2017. The candidates for the office of Mayor and 16 candidates for City Council appeared and discussed their views on the role of preservation. The audience of over 150 citizens listened carefully and many stayed after the event to talk with candidates individually. Thanks again to everyone who participated and especially to our moderator, Courtis Fuller, WLWT, for adding depth (and some welcome humor) to the evening. A three minute video summary can be viewed by clicking here or on the video below. Candidates Forum on HP from Paul Muller on Vimeo. Special Thanks to the candidates, Courtis Fuller, WLWT, for serving as the moderator of the candidates forum and to Memorial Hall for hosting. As a supplement to the forum we invited candidates to answer the following six questions in writing prior to the event. They were asked to limit answers to less than 100 words. Click on the names below to see responses or scroll for all.List. 1 Please state your views on the role of historic preservation and our historic resources in the future of the city. Historic preservation is integral to Cincinnati and our success. When I was on Council, I wrote the city’s TIFF district law which has enabled hundreds of millions of dollars for OTR to be revitalized as an historic district. That investment in historic preservation has paid dividends in the revitalization of OTR. Similarly, when I became Mayor, I fought to keep both Museum Center and Music Hall as part of the countywide museum tax; however, I still worked to pay for Music Hall renovations regardless of its exclusion from the county levy. I also fought to ensure that the historic Winold Reiss glass mosaics that originated in Union Terminal would not be destroyed when they could no longer be displayed at CVG. They are now mounted and secured in state-of-the-art protective display cases at the Convention Center. Lastly, I continue to lead the fight for the preservation of King Records. Our history defines our character as a City. 2. What will be your top three priorities to ensure the preservation of Cincinnati’s historic buildings sites and neighborhoods? 1) Continue to incentivize historic preservation through the private sector and public-private partnerships. I am encouraged that we will now provide a 15-year abatement on historic preservation, which has not occurred in the past. More needs to be done to increase the tools available to provide incentives toward historic preservation. 2) Commit to preserving the King Records building, which tells a compelling story of Cincinnati’s history and significance in the music industry. We cannot afford to lose that piece of our history. 3) Continue the progress made in Over-the-Rhine, which was once called “endangered” and is now an award-winning success story in preservation. But we must also apply this lens to other neighborhoods that have seen disinvestment in the past. 3. What is your view on the role of Cincinnati’s local historic districts? Would you support the establishment of new historic preservation districts in the city? If so, would there be any criteria or limits on the number or type of new districts? Yes, I believe there should be new historic preservation districts. As stated above, I believe there is a lot of opportunity to replicate what has been done in Over-the-Rhine and I believe that increasing the number of historic districts can be part of that. I support a balanced approach that looks at the historic composition of the neighborhood, how supportive the community members are of the establishment of a historic district, and various other factors, but as we’ve seen, historic preservation can be a true catalyst for neighborhoods that have long been neglected. 4. Would you support the establishment of a city capital fund to pay for the preservation of historic public spaces and infrastructure (i.e. steps, alleys, certain streetscapes, bridges, walls, trees, fences, curbs, streets, etc….)? Why or why not? If so, what size fund would you recommend? I support the establishment of a fund. I have actually been working with Vice Mayor Mann and Councilmembers Sittenfeld and Flynn on a proposal that would allow individual neighborhoods to reinvest development dollars into historic preservation and other supportive projects. 5. Would you support establishment of a historic preservation tax abatement similar to (or in lieu of) the city’s new construction/renovation CRA abatement? This could be a 10-15 year abatement to incentivize historic preservation anywhere in the city. Why or why not? Yes, as discussed above, I believe that we should continue to find ways to incentivize historic preservation in the private sector and through public-private partnerships. This not only preserves Cincinnati’s historic culture, but also serves an important role in revitalization of the urban core as more people see the value in historic renovation and preservation. 6. What can we learn from the ongoing revitalization of OTR that can be applied to other communities? OTR has taught us that historic preservation is unmatched as a catalyst for revitalizing neighborhoods in Cincinnati. As more people recognize the intrinsic value historic properties bring to the culture, atmosphere, and experience in our neighborhoods, it is imperative that the City encourage, incentivize, and invest in historic preservation. As stated above, when I was on Council, I helped establish public private partnerships which has undertaken the large majority of the historic renovation in OTR. Without both the public and private sector, the amazing renaissance in OTR would not be possible and we should strive to expand that to other neighborhoods. 1. Please state your views on the role of historic preservation and our historic resources in the future of the city. Our history is our future. Cincinnati’s historic buildings are one of our biggest treasures, and must be protected. Our city needs leadership that values the economic importance of our historic assets, and values the urban fabric that can not be recreated after our buildings are demolished. I live in a historic district. Our Historic Districts are of the many attractive things about living in Cincinnati. People want to live in a city that preserves its past and weaves in new development, while enhancing historic character. Encouraging and promoting historic tourism and as a selling point to new city residents and businesses. As Mayor, I will be an advocate and ally for our historic buildings in jeopardy of demolition. I believe our historic districts our vital to the fabric of our city and a source of pride for our city. These districts give our neighborhoods character and are vital to city’s heritage. I would support the establishment of new historic districts. The preservation of historic public spaces and infrastructure is critically important for a city whose history is as rich and notable as Cincinnati . That being said establishing and cultivating a fund to support that work is a both a great need and a significant priority. The conversation that we need to have is around finding the right mix of private and public partnerships to ensure that we can honor the history and character of our great city. I would recommend a Historic Preservation tax abatement in order to help preserve our historic homes and buildings. The abatement should include historic business to help with facade and structural improvements and a residential abatement for historic home preservation. I have a Ready, Set, Go Plan for neighborhood development. We have seen great development in OTR and we need to make sure our all neighborhoods see the same progress. Our Ready neighborhoods need investment to get to become safe and clean. Our Set neighborhoods need strategic investments in their business districts and our Go neighborhoods like OTR need to have their progress maintained. Historic preservation is vital to maintaining our dense urban fabric and also keeping our history and beautiful architecture that sets us apart from other cities across the country. Our historic buildings are jewels to be treasured. This is why I led the fight to save the Dennison Hotel. Vetting mayoral nominations to Historic Conservation Board to make sure that demolitionists aren’t appointed. Reviewing codes related to historic preservation to see how they can be strengthened and improved. Review abatement policy so that we don’t have perverse incentives to demo historic structures to be replaced with new construction. Historic districts play a vital role in making us who were are as a city and preserving our history. Yes I would support new districts and would work with preservationists and other stakeholders on their specifics. Yes. These spaces and infrastructure are vital to a vibrant, walkable, and growing city. I would work with preservationists, administration, and other stakeholders to determine the amount of the funding needs. Having the will to fight for the preservation of historic buildings in Cincinnati is vitally important and I have done that. As a resident of OTR, I take great pride in living in a diverse and historic neighborhood. We need to maintain diverse housing stock as well so that residents of all income levels can call a neighborhood home. Additionally, we have learned that building that do look like they are in really terrible shape can be salvaged and brought back to their former glory. As the owner of a West End property that was built in 1888 and is now beautifully rehabbed and home to people again, we can, and we will save our historic building stock. Cincinnati is the home of some incredible future. From one side of Cincinnati to the other, we have historic buildings, infrastructure and spaces. I firmly believe that these places must be preserved, and we must set aside resources for future preservation. Additionally, I think we need to approach this preservation in a more equitable way. Many neighborhoods with historic gems don’t know the resources available to them for preservation and restoration. My top three priorities for preservation in Cincinnati would include: 1) increased public education 2) increased public engagement, and; 3) expanding on our organizational capacity to preserve and protect our city’s rich culture and history. Government exists to serve the people. Historic preservation should therefore be a process that not only includes the public, but one that gives The People the strongest possible voice at the decision making table, regardless of zip code. Our local historic districts are integral to the preservation of our city’s culture and history. They enable us to promote the conservation, protection, restoration, rehabilitation, use and overall enhancement of structures and districts in the City that possess special historic or architectural value. You cannot put a price on this. Yes, I would support the creation of more historic districts. I do, however, believe we should limit the number of districts – but have that base upon a formula. Perhaps we can refer to similar cities like Cincinnati to see if there are good formulas for the number of historic districts. Yes, I would support the creation of a capital fund to pay for infrastructure, and we can include the preservation of historic spaces in that capital fund. All across Cincinnati, our infrastructure is in desperate need of repair – so too are our historic spaces. I would support the establishment of such an abatement in addition to the current ones. However, I think the emphasis should be on increasing the education and awareness of these opportunities in neighborhoods that aren’t getting the same attention as downtown and Over-The-Rhine. This might in turn help combat concentrated poverty by educating Cincinnati residents about the historic nature of their own homes and properties. Many people may not even be aware that they live in areas or on properties that would be eligible for historic designation. It’s the city’s job to ensure that funding structures are coupled with adequate education to ensure that all people, regardless of income and zip code, enjoy the benefits of city programs. While our local economy has benefitted from the revitalization of OTR, many have been forced out of their homes because they cannot afford the increased prices. Once elected, I will explore the possibility of introducing rent abatements in targeted areas to help guard against gentrification and rapid rent hikes in areas that are undergoing and/or have undergone significant economic development in recent years. There also needs to be more equity is who can access tax credits to develop historic building. Often times it is people who need the credits the most who can’t access the credits needed. Creating cycles of wealth and continuing generational poverty. The role of historic preservation is to preserve buildings, landscape and neighborhoods. I believe the citizens and government will invest in restoration and upkeep of historic landmarks and this will continue to increase job growth, protection of important landmarks for all cultures invested in creating historic and significant contributions to our beautiful city! Apply the preservation process successfully, Update building systems appropriately accommodate life /safety and security needs. To educate are constituents and visitors on our rich heritage, preserving our legacy, protecting archaeological resources, and retaining history and authenticity! Yes, (to new historic districts). The ability to increase the value of potential commercial value of properties and preserve authenticity and educate our community on its rich history, and there would be no limits on contributors as it relates to our diverse history. Yes, it is important for the city to invest in itself as it relates to tourist, retaining new residents and the quality of life of current residents! Yes, if local residents who were specifically returning citizens were trained in general carpentry, brick laying, painting, and restoration. I believe this would have a two fold significant contribution to the appreciation of our cities culture and its beauty therefore decreasing our crime rate! I am a Certified Professional Estimator and a LEED AP showing I understand construction estimating and green building practices. Historic preservation is what I do for a living. Our historic buildings not only set us apart from other cities in our region but help differentiate our 52 neighborhoods from one another. To name a few examples, In West End we have the old Regal Theatre, in Walnut Hills the Paramount Building, and Westwood has one of the few remaining iconic Town Halls. These structures give a proud identity to our City and our neighborhoods. To preserve our past we are preserving both our character and our pride. As a Certified Professional Estimator who specializes in historic preservation I see a need for a historic structure stabilization fund. The Stabilization process simply repairs a building to a state which will allow it to survive another 10-15 years until an end user can be found. Currently the City’s Historic Conservation Board consists of 7 members which includes a mandatory two architects. Demolitions of historic buildings typically are “justified” because saving the building would cost too much. The number of architects should be cut to one and replaced with a Certified Professional Estimator who understands the costs of preserving historic structures. Currently Cincinnati has 28 districts listed on the National Register. Only 23 have a conservation guideline in place. We must work to ensure all 28 districts have proper guidelines in place to ensure conservation is followed. The 28 districts are in place to ensure that we preserve our history. Twenty-three of the districts have guidelines to follow. These guidelines help ensure that conservation practices are followed within those districts. Yes, I would support establishment of new historic preservation districts in Cincinnati and yes, there would be strict criteria for a proposed district to meet, but I do not believe we should limit the number of new districts. Yes. We should establish a fund and treat it like the Neighborhood Business District Improvement Program where neighborhood business districts submit projects and compete against one another for the available funds. We could restrict this to only historic districts at first and allow those districts to compete for funding. Funding should start off at $250,000 to $500,000 per year. The community reinvestment area abatement program has encouraged development via renovation or new construction for years. I do not think we need to establish a new historic tax abatement, I simply think we need to add a column on the CRA abatement chart. If the building is considered historic and a proper restoration, per conservation guidelines, is planned for that building then the property could qualify for a tax abatement. The OTR Community Council has consistently put up red flags regarding new development. The reason for the red flags range from not enough low-income housing to demolition of historic structures. The process to approve projects appears rushed and should be slowed to allow for community input without jeopardizing new development. Improving entire blocks at a time creates more positive momentum than improving a similar number of buildings randomly spread throughout a neighborhood. Focused development works. We can and should apply this model to other neighborhoods, starting with business districts first. We have lost a lot of buildings in OTR from neglect and purposeful demolition and those buildings can never be rebuilt. The buildings which have been saved are the reason OTR is a success story. The new “infill” structures are not what makes OTR cool, it’s the structures which were preserved that create that cool vibe. We must remember that in every neighborhood across Cincinnati. The physical fabric of our city is very important, and our historical buildings and resources are critical to maintaining that fabric. We are fortunate to have so many distinctive neighborhoods, each with its own flavor and character. They also bring a lot of tourism to Cincinnati – and cause people who come for other reasons to stay a day or two longer. Over-the-Rhine is part of this –others would be, if we put marketing and development efforts into them. There are historic districts all over Cincinnati that are not marketed that way. Let’s share our resources with other cities and countries! We need to protect our historic districts with teeth in those ordinances – so owners cannot simply neglect buildings, then claim they are too far gone to be restored – so the owner can put up a new building that does not fit into its surroundings. Fines that increase over time, and enforcing laws already on the books would be good. Tax abatement is available in many neighborhoods for many kinds of buildings. Tax abatement for improvements and restoration for historic buildings should be available. Funding to CDCs to keep history alive (like Harriet Beecher Stowe House) would be great. Yes, we should add other districts where historic buildings exist unprotected now. We should widely publicize the districts we have, and educate community groups about the importance and potential of their districts –so they can be part of marketing them to friends and family around the globe. Let’s beat the drum for these resources, and build excitement about them – so the next time the New York Times visits, they will recommend spending more than 36 hours here! For me the criteria for new districts would be to protect and enhance historic resources. 4. Would you support the establishment of a city capital fund to pay for the preservation of historic public spaces and infrastructure (i.e. steps, alleys, certain streetscapes, bridges, walls, trees, fences, curbs, streets, etc….)? All these restorations and protections would fit right into the 21st century WPA (Works Progress Administration, from the Great Depression) that I have proposed. They would maintain the physical infrastructure of the Cincinnati, train Cincinnatians in those jobs and skills and pay them to do this work – which would quickly revolve back into the local economy. I would recommend starting with $5 million, and growing the program, which will grow Cincinnati back to prosperity, and drastically reduce the number of families living in poverty. 5. Would you support establishment of a historic preservation tax abatement similar to (or in lieu of) the city’s new construction/renovation CRA abatement? This could be a 10-15 year abatement to incentivize historic preservation anywhere in the city. As I answered in Question 2, I believe a tax abatement for historic preservation would be critical to preserving our historic infrastructure. And that infrastructure is the reason why a global transportation expert, Jared Walker, in town for a Chamber conference several years ago said that Cincinnati should not see its competition as Indy or Columbus or Louisville. He believes our competition is San Francisco, and that we should step up and market ourselves that way. I have heard those who moved to Over-the-Rhine for its diversity of incomes and lifestyles complain that those qualities are disappearing from the community. So what they moved to OTR for is less and less to be found. And I know folks in Walnut Hills are concerned that as they redevelop their community, some of their neighbors may not be able to afford to stay. These concerns resonate around the city. More equitable development of all our communities is the answer to this question. Let’s support each neighborhood in growing into its own best self. 1.​ ​Please​ ​state​ ​your​ ​views​ ​on​ ​the​ ​role​ ​of​ ​historic​ ​preservation​ ​and​ ​our​ ​historic​ ​resources​ ​in​ ​the​ ​future​ ​of the​ ​city. Historic preservation is essential to maintaining the integrity of Cincinnati’s history, inspiring pride in the City and protecting the built environment. While, written and oral histories are essential to telling the story, the visible presence of the built environment enhances and further validates the story of Cincinnati and its contributions to America’s history. Historic resources are among our greatest assets offering a number of opportunities to positively impact our local economy through development, re-development, job creation, tourism, and home ownership. Identifying and recruiting developers interested in and committed to historic preservation for rehabilitation and restoration of building. I would work with the Mt. Airy Town Council and concerned residents in their efforts to obtain a designation to preserve the Water Towers. Support the exploration of other neighborhoods or landmarks to receive a historic neighborhood or site designation. Local historic districts have great potential to benefit and strengthen the City’s economy, decrease sprawl, blight and eliminate undesirable activity in and around vacant buildings. Creation of new historic preservation districts will potentially help expand and attract development beyond the OTR/Downtown. Broadening the appeal of the City and generating much needed and desired neighborhood developments and investments. Capital funds are ideally used to cover the expense of maintenance and improvements to City assets that improve or extend the life of a public asset. In consideration of this fact, I am in favor of exploring the possibilities of a capital fund funded at a level equal to the current expense of on-going maintenance of these areas. Preservation of historic public spaces protects valuable assets in our city and helps create a more desirable place to live, work and play. Again, I am in favor of aggressively pursuing historic preservation in Cincinnati. Expanding the current CRA to include incentives for historic preservation would be an option to consider with a reasonable length of time 5-10 years. OTR is a vibrant and thriving neighborhood. A great asset and attraction to the City and a can provide lessons learned to everyone from City officials, developers, neighborhood groups to residents. A very big lesson is to include in the revitalization focus an equitable development plan that addresses job creation, limits displacement and includes affordable housing for the most vulnerable in the neighborhood. We can also learn how to use diverse ways to engage residents to get their input on the plan. Neighborhoods should be designed by current residents with input from the broader community. Cincinnati has a rich cultural heritage that is irreplaceable. The architecture of our city reflects our various and unique cultures, and preserving our historical buildings only strengthens our communities and encourages the next generation to invest their time and talent in the richness of our city. Preservation initiatives also support a more attractive, active, walkable, and green city, all of which are key to ensuring the quality of life for future generations with cleaner air and more green spaces. Working with developers to determine how to best invest and support historical preservation, further empowering our historical preservation organizations and leadership, and making it clear the City Hall supports the preservation of historical buildings. Some of Cincinnati’s most thriving neighborhood business districts are great examples of how we have supported historical preservation in neighborhoods. Whether it be Hamilton Avenue in Northside and College Hill, or Westwood’s thriving corner at Montana and Harrison, these historic business districts are taking center stage in the city’s development, and should be preserved in a way which fosters their growth. I support local historic districts, and would support the creation of additional districts in the city. I don’t have a strong opinion about whether or not there should be limits on the number of new developments, and would look to historic preservation leaders for advice. Preserving our historic districts to be fully functioning and integrated into the rest of the city will make them more accessible to residents, businesses, and tourists. I would support a fund dedicated not only to supporting historic districts’ public spaces and infrastructure, but also to encouraging mixed-income and use apartments and small businesses to thrive in some of our most important neighborhoods. I would look to experts as to what a meaningful fund would look like, including ways to leverage private funding and outside resources on restoration projects. I would, especially in neighborhoods outside of the immediate Downtown/OTR districts. Sustaining historic buildings and districts across all of Cincinnati is essential to ensuring that our full history and culture is maintained and respected. It would also incentivize developers to renovate rather than tear down historic buildings. The revitalization of Over-The-Rhine teaches an important lesson of inclusion when it comes to historic preservation. When efforts to revitalize a community begin, it’s important to give the community a voice to preserve the culture of the neighborhood under construction. The renovation of buildings in OTR has brought on a new wave of buyers and tenants, but pushed or priced out many lifetime residents rooted in the community. Lessons learned from OTR can point the city towards more responsible and restorative revitalization that preserves not only the historic buildings in the area, but the integrity of the community. Cincinnati’s historic architecture is one of its defining characteristics. The historic nature of our city is a large part of the reason I chose to move here and build my career here. As a real estate developer, I have firsthand knowledge of our local historic district, the Historic Conservation Board, State and Federal Historic Preservation Tax Credit Programs, and the superlative nature of Cincinnati built environment. As a member of the Over-the-Rhine Foundation, I was proud to help organize the Owner-Occupied Workshop series which taught individuals the key steps to developing historic property. On City Council, I will be the strongest advocate for our historic assets. Advocate for the appointment of qualified and committed preservationists and design professionals to the Historic Conservation Board, Zoning Board of Appeals, and the Urban Design Review Board. Expand the tax abatement program to include a historic preservation tax abatement. Work tirelessly to find and create realistic, market-friendly solutions to endangered historic buildings and landmarks. Support the creation of an Historic Preservation Strategic Plan (HPSP) for the city. The HPSP would guide the future of preservation in Cincinnati. I support Cincinnati’s local historic districts. They provide tremendous value to our citizens by protecting our history. Regarding new historic preservation districts, I would support the creation of new districts as appropriate and I would look to the recommendations of communities, the Cincinnati Preservation Association, and the Urban Conservator for guidance. Yes, I would support a fund for the preservation of historic assets. These assets need to be preserved and City Council would best serve our citizens by making a plan and a budget to preserve them. By failing to prepare for the preservation of our historic public spaces and infrastructure, we spend more than is necessary. Regarding the size of the fund, I would begin by studying the size of the budget items currently allocated to these public spaces and infrastructure. On City Council, I would advocate for the creation of a task force consisting of the Cincinnati Preservation Association, OTR Foundation, Urban Conservator, Historic Conservation Board, and others to create a Historic Preservation Strategic Plan (HPSP) for the city. The HPSP would guide the future of preservation in Cincinnati. Yes, I would support the establishment of a historic preservation tax abatement to complement the current abatement programs. Development and preservation go hand in hand. I will be preservation’s strongest voice on City Council. As a real estate developer with experience in historic preservation in OTR, there is much to be learned. I think the primary lesson is that no building is an island. And secondly, our neighborhoods are more than just buildings. They are composed of what Edmund Burke called “little platoons” – family, church, local community, businesses, private organizations. The revitalization and repopulation of Over-the-Rhine has taught any serious student that change is possible and is never universally applauded. The effects of change on the “little platoons” cannot be ignored. In order to create truly inclusive development, the effects of past change must be considered while planning for future change. Our community has amazing buildings from the nineteenth and early twentieth century which should be preserved whenever possible. As a relatively early American city, our older buildings are really a special distinguishing attribute that should be cherished and celebrated. Value and support the Historic Conservation Board; include preservation considerations in evaluating abatement requests in connection with development proposals; give special support to neighborhoods which work to restore the past in their community plans. 3. What is your view on the role of Cincinnati’s local historic districts? Would you support the establishment of new historic preservation districts in the city? If so, would there be any criteria or limits on the number or type of new district. I was a member of council when the historic district legislation was adopted and the first districts established. The question then, and I hope now, is not in how many but rather which areas qualify to be established as districts. The legislation speaks pretty clearly if one fairly applies its criteria. This is a great idea subject only to the challenges of municipal budgeting. This kind of preservation can be the catalyst for so much more. Small investments in these categories should have tremendous catalyzing impact. It is important to get something in the budget (say $100,000) that, with visible impacts, can be increased. Several of us are looking at changes in the tax abatement process that would incentivize affordable housing. I am not sure we can address both affordable housing and historic preservation from this source. Saving historic buildings and neighborhoods has amazing benefits ranging well beyond the investment of public and private dollars. The buy in of the corporate community is important to success. Understand buildings and areas that are unique and envision their roles in inspiring and leading the renaissance of a neighborhoods. I​ ​fully​ ​support​ ​the​ ​preservation​ ​of​ ​our​ ​historic​ ​resources.​ ​I​ ​believe​ ​it​ ​is​ ​important​ ​to​ ​preserve​ ​our​ ​historic cultural​ ​resources​ ​through​ ​education,​ ​advocacy​ ​and​ ​any​ ​technical​ ​support​ ​that​ ​is​ ​accessible.​​The preservation​ ​of​ ​historic​ ​resources​ ​is​ ​important​ ​to​ ​the​ ​advancement​ ​of​ ​our​ ​community. 2.​ ​What​ ​will​ ​be​ ​your​ ​top​ ​three​ ​priorities​ ​to​ ​ensure​ ​the​ ​preservation​ ​of​ ​Cincinnati’s​ ​historic​ ​buildings​ ​sites and​ ​neighborhoods? As​ ​a​ ​member​ ​of​ ​Cincinnati​ ​City​ ​Council,​ ​​ ​my​ ​top​ ​three​ ​priorities​ ​to​ ​ensure​ ​the​ ​preservation​ ​of​ ​Cincinnati’s historic​ ​buildings​ ​sites​ ​and​ ​neighborhoods​ ​I​ ​will​ ​work​ ​closely​ ​with​ ​the​ ​port​ ​authority​ ​to​ ​ensure​ ​that buildings​ ​identified​ ​as​ ​historic​ ​sites​ ​are​ ​preserved,​ ​strive​ ​to​ ​educate​ ​the​ ​public​ ​about​ ​historic​ ​sites​ ​and secure​ ​resources​ ​to​ ​preserve​ ​historic​ ​sites. 3.​ ​What​ ​is​ ​your​ ​view​ ​on​ ​the​ ​role​ ​of​ ​Cincinnati’s​ ​local​ ​historic​ ​districts? Would​ ​you​ ​support​ ​the establishment​ ​of​ ​new​ ​historic​ ​preservation​ ​districts​ ​in​ ​the​ ​city?​ ​If​ ​so,​ ​would​ ​there​ ​be​ ​any​ ​criteria​ ​or​ ​limits on​ ​the​ ​number​ ​or​ ​type​ ​of​ ​new​ ​districts? As​ ​a​ ​native​ ​of​ ​Cincinnati,​ ​I​ ​value​ ​Cincinnati’s​ ​historic​ ​district.​ ​​ ​I​ ​would​ ​support​ ​the​ ​establishment​ ​of​ ​new preservation​ ​districts​ ​in​ ​the​ ​city.​ ​​ ​Because​ ​we​ ​have​ ​52​ ​neighborhoods​ ​and​ ​there​ ​may​ ​be​ ​sites​ ​that​ ​citizens would​ ​like​ ​to​ ​preserve.​ ​​ ​I​ ​would​ ​be​ ​open​ ​to​ ​consider​ ​those​ ​sights​ ​so,​ ​the​ ​number​ ​would​ ​vary;​ ​likewise,​ ​I am​ ​not​ ​in​ ​a​ ​position​ ​to​ ​identify​ ​a​ ​number. 4.​ ​Would​ ​you​ ​support​ ​the​ ​establishment​ ​of​ ​a​ ​city​ ​capital​ ​fund​ ​to​ ​pay​ ​for​ ​the​ ​preservation​ ​of​ ​historic public​ ​spaces​ ​and​ ​infrastructure​ ​(i.e.​ ​steps,​ ​alleys,​ ​certain​ ​streetscapes,​ ​bridges,​ ​walls,​ ​trees, fences, curbs,​ ​streets,​ ​etc…. )?​ ​Why​ ​or​ ​why​ ​not?​ ​If​ ​so,​ ​what​ ​size​ ​fund​ ​would​ ​you​ ​recommend? I​ ​would​ ​support​ ​the​ ​establishment​ ​of​ ​​ ​city​ ​capital​ ​fund​ ​to​ ​pay​ ​for​ ​the​ ​preservation​ ​of​ ​historic​ ​public spaces​ ​and​ ​infrastructure.​ ​​ ​I​ ​believe​ ​that​ ​the​ ​historic​ ​spaces​ ​are​ ​essential​ ​to​ ​the​ ​history,​ ​growth and development​ ​and​ ​progression​ ​of​ ​the​ ​city.​ ​​ ​It​ ​provides​ ​essential​ ​information​ ​regarding​ ​the​ ​advances​ ​of​ ​the city​ ​and​ ​what​ ​improvements​ ​are​ ​necessary​ ​to​ ​keep​ ​the​ ​city​ ​moving​ ​forward. 5.​ ​Would​ ​you​ ​support​ ​establishment​ ​of​ ​a​ ​historic​ ​preservation​ ​tax​ ​abatement​ ​similar​ ​to​ ​(or​ ​in​ ​lieu​ ​of)​ ​the city’s​ ​new​ ​construction/renovation​ ​CRA​ ​abatement?​ ​ ​ ​This​ ​could​ ​be​ ​a​ ​10-15​ ​year​ ​abatement​ ​to incentivize​ ​historic​ ​preservation​ ​anywhere​ ​in​ ​the​ ​city. ​ ​Why​ ​or​ ​why​ ​not? ​I​ ​have​ ​major​ ​concerns​ ​about​ ​the​ ​amount​ ​of​ ​tax​ ​abatements​ ​that​ ​continue​ ​to​ ​be​ ​offered​ ​across​ ​the board.​ ​​ ​Our​ ​tax​ ​base​ ​is​ ​important​ ​to​ ​the​ ​ensure​ ​that​ ​funding​ ​is​ ​available​ ​for​ ​public​ ​services,​ ​the​ ​city​ ​is maintained​ ​and​ ​basic​ ​human​ ​needs​ ​are​ ​met.​ ​​ ​I​ ​fully​ ​support​ ​the​ ​city’s​ ​new​ ​construction/renovation​ ​CRA abatement. 6.​ ​What​ ​can​ ​we​ ​learn​ ​from​ ​the​ ​ongoing​ ​revitalization​ ​of​ ​OTR​ ​that​ ​can​ ​be​ ​applied​ ​to​ ​other​ ​communities? We​ ​can​ ​learn​ ​that​ ​development​ ​does​ ​not​ ​have​ ​to​ ​mean​ ​displacement.​ ​​ ​Additionally,​ ​the​ ​healthiest​ ​most thriving​ ​communities​ ​are​ ​diverse​ ​and​ ​mixed​ ​incomes.​ ​​ ​Most​ ​importantly,​ ​we​ ​should​ ​remember​ ​to put​ ​it’s important​ ​to​ ​put​ ​people​ ​over​ ​politics​ ​and​ ​that​ ​the​ ​best​ ​investment​ ​we​ ​can​ ​make​ ​is​ ​ensuring​ ​that quality of​ ​life​ ​of​ ​vulnerable​ ​populations. Our city’s most valuable asset is our historic building stock, and Cincinnati has the largest collection of Italianate architecture in the country. Our renovated buildings in Over the Rhine, a National Register Historic District, are here because preservation advocates led by CPA fought long and hard to prevent unnecessary demolitions. I became educated in 2001, reporting a documentary for WCPO-TV “Visions of Vine Street.” The doc inspired then-Mayor Charlie Luken to make Vine Street his #1 priority, which led to 3CDC and OTR revitalization. In reporting on the urban core, I fell in love with Cincinnati. I view historic districts as a vital way of telling our city’s cultural story, and promoting sustainability and tourism. The Dayton Street and Lytle Park Historic Districts are important, and the emerging Brewery District and King Records in Evanston will only add to our city’s success. 4. Would you support the establishment of a city capital fund to pay for the preservation of historic public spaces and infrastructure (i.e. steps, alleys, certain streetscapes, bridges, walls, trees, fences, curbs, streets, etc…)? Why or why not? If so, what size fund would you recommend? I would be supportive of a city capital fund to pay for historic public spaces and infrastructure. This fund could help us ensure historic spaces are cared for and preserved. I’m not sure what amount is appropriate at this time. When I served on council 2009-2013, I led citizens to transform Ohio’s side of the Purple People Bridge from eyesore into beautiful parklet. I then authored legislation creating a parklet program for Cincinnati. I would be open to a tax abatement for historic preservation, and want to do more research on options. I am very supportive of LEED tax abatements to drive green building, but know that LEED is hard to achieve with historic properties. Anything to incentivize recycling and renewing historic buildings is a good thing, in my opinion. We have learned that it takes focus, commitment and lots of money to make a difference. If not for the partnership between the city and private companies funding the work of 3CDC, I doubt we’d be enjoying the renaissance in OTR. We have learned it’s wise to incentivize creation of affordable and workforce housing as we invest in neighborhoods, in order to maintain diversity. One downside of OTR now, is that many people are simply priced out of living there. We’re losing some of the diversity of residents that makes OTR so rich and wonderful. I consider myself City Council’s greatest advocate for historic preservation. I filed the paperwork to designate the Dennison Hotel as a historic landmark and led the efforts to save the Hudepohl Smokestack. I will continue to lead the fight against demolitions in our city, both in historic districts and in our neighborhoods. Stabilization and preservation is a more sustainable outcome over demolitions. People don’t come to Cincinnati and say, “show me your suburbs”, they want to see our historic urban neighborhoods, walkable business districts, and our amazing historic housing stock. These are assets we must preserve and defend as they are the key to our growth and revitalization. Reduce City funded demolitions in exchange for City funded stabilization. Expand historic district boundaries; reduce subsidies for teardowns and new construction, while boosting incentives to renovate buildings. They highlight our history and preserve our greatest assets. Yes, I support new historic districts. The criteria would be based on the assets of the district itself, and I do not see a need to artificially limit districts with a cap. Yes. Our TIF dollars too frequently get used solely for parking garages. This needs to change, and we need to see more dollars going to public spaces. Rather than choose a single dollar amount, I’d prefer creating source that is sustaining over an extended period of time. Yes. Historic properties should be given a greater boost than new construction (which, as in fill, I am still supportive of), as they use what we already have, and often create greater value once they are completed. Preservation is an economic driver. Preservation builds community. And preservation should be designed in an inclusive way, ensuring access to renovated properties by a wide range of income levels. Cincinnati’s history is an essential part of what makes us special, and our buildings and spaces help tell our story. At a personal level, I am very supportive of preserving our history as much as we can. But perhaps just as important, preservation has also been shown to be a huge part of our economic development and growth over the past decade. The success of neighborhoods like OTR, Walnut Hills, and others where the preservation of historic buildings are the foundation or catalyst for driving the economic vitality of a neighborhood simply cannot be ignored. It is what makes us unique and should be celebrated, and it is also hugely important economically. Luckily perhaps, our need to improve our housing stock to address issues related to poverty actually dovetails nicely with historic preservation of historic homes and buildings. One of the most critical priorities for the next term is addressing our shortage of affordable housing – as well as the environmental health and other issues associated – with so much of the population living in old, mold-and-lead-filled buildings with no air circulation. The opportunity to save and update historic homes in the core neighborhoods like Walnut Hills, Avondale, College Hill and other neighborhoods is a win-win. As chair of the Council committee overseeing environmental and sustainability issues, we must live by the motto that the greenest building is the one that is already there. One exciting tool coming online very soon is expanding the CRA program to ensure that rehab and renovation projects which want to build to LEED standards get the same tax treatment as new construction. Hamstrung by State Law, this really hampered our ability to see exciting innovation in preservation projects, such as using LEED at the highest levels for historical renovation projects. Finally, continued investment in our business districts is a crucial priority for the next term. Many of our business districts have rich histories and wonderful buildings – whether former bars or movie palaces or storefronts – ready to be celebrated for their architecture and historical significance, bringing pride to the neighborhoods, and repurposed as community spaces. In sum, we can leverage the success of OTR and bring about economic and housing stabilization in the neighborhoods by restoring historic gems to former glory. Further, I think we should shout our success stories proudly to ensure that the community – both developers and buyers – continue to value preservation. I absolutely support local historic districts. Expansion of historic districts can be used to leverage private investment into these spaces – for example, the donations to support the brewing heritage trail or the private investment in the Findlay Market historic area. Health concerns with respect to buildings that are posing a hazard, economic stability, and other unique circumstances are factors that are worth accounting for in determining the scope of adding districts – in other words we can be choosy – but a numerical limit does not seem necessary. I would be open to exploring the possibility of putting aside capital dollars to preserve public spaces especially in cases 1) where infrastructure is hazardous or poses a health risk and is also historically significant 2) where these improvements leverage or support other investment in the neighborhood or area and 3) where it is supporting other capital investment by the City. The CRA is a tool I support to encourage incentivizing the kind of economic development that matches our priorities as a city. As mentioned above, due to State law, we now have the ability to offer up to 15 year abatements on projects that previously would have been capped at 12 years, which is a big deal and will make renovation more desirable, as well as spur innovation within renovation: i.e. making “green” and accessibility more economical. One challenge with the CRA is ensuring that the administrative costs associated with implementation are as low as possible, and therefore I would support a historic preservation tax credit for historically significant projects if there was a reputable third party tool in place to make the designation so as to not add vagueness or subjective decision-making by the City’s administration processing the abatements. Another challenge with the CRA is that in certain cases, TIFs make more sense, so in order to really accomplish the goal, there would need to be a way to ensure that a TIF district wasn’t a loophole (unless that is determined to be the goal). That there is a huge upside to celebrating our history and historic buildings, and that the community and the market support this work. There is also a desirability for density and walkability, which means that we need a zoning code that supports more modernized parking requirements. Our history is part of the rich story of who we are, where we came from, and historic structures are an important link to our past. When we come across an historic artifact or structure, it should be seen as an opportunity to learn and possibly preserve a part of who we are. Sometimes redevelopment is the appropriate path, but there is often not a need to act in haste because once we eliminate a piece of our history, we can never get it back. We should bring neighborhood councils together to identify our historic assets and evaluate if they are at risk. Each neighborhood has a unique history, and we should encourage the preservation of that history through photo compilations, oral histories, and primary documents – the city can be part of that as the “glue” for our 52 neighborhoods – and should coordinate with neighborhoods and nonprofits with an interest in historic preservation. City Hall could feature a different neighborhood and its history periodically in the lobby of City Hall – demonstrating each neighborhood’s rich contributions to our city. Cincinnati’s historic districts are invaluable assets to our community because they help to tell our story, and they are important not just for our current generations but our future generations as well. We have 28 national historic districts in Cincinnati, and 30 local historic districts. Cincinnati also leads the State of Ohio in listings on the National Register of Historic Places. Although we have many historic districts and registered places, I do not feel that an arbitrary limit is appropriate. Also, there should be criteria established for new or expanded districts. We must balance growth and redevelopment with preservation. I am hesitant to discuss starting a new city-backed funds until we reach a point when the budgeting process is more stable. Our city already partially balances the budget by deferring maintenance as stated in the 2018 budget report. However, I will be the first council member to be in front to help build a foundation through private funding for the preservation and maintenance of our historic spaces. Typically, tax abatements are linked to job creation. There is a trade-off in that we forego our immediate tax revenue in exchange for development that creates jobs and is replaced by increased income tax. I would rather weigh more creative methods of funding that might include property assessments to pay for historic preservation bonds issued for the sole purpose of preservation similar to the way PACE bonds work. OTR revitalization is an example how redevelopment marries preservation. Although there is sweeping change through OTR, we can still experience the grandeur of the historic neighborhood. Public Private Partnerships and other types of investment have been critical to the revitalization of this neighborhood that has become attractive to a new generation that embraces urban lifestyles and historic neighborhoods. Now that OTR is well on its way to being a success story, I would like to see similar strategy toward revitalization applied to our neighborhoods. At the same time, we need to be mindful of the people who have lived in the neighborhood for decades, even generations, to be sure they are not displaced and that a variety of housing options remain available.